The magnificently executed refit of the yacht Kaori. Built by Palmer Johnson as Mandalay. A major refit provides a special challenge to a design office, especially when altering an iconic yacht such as the Brierley/Paine designed Mandalay. Great respect for the work of the original designer is critical to maintaining the characteristics that moved the owner to purchase her. The appearance of any new or modified features must be congruous to that of the original design. Mandalay was built by Palmer Johnson in 1992 and had since been sold and renamed Kaori (Japanese for Fragrant Breeze). As part of an extensive refit executed by Rybovich in West Palm Beach, Florida; we were asked to create an extension of the pilothouse roof that went aft to cover the main cockpit. The owner's admiration for the original designers was apparent, so it was important that the new structure be crafted to flow from the existing one so it would appear to have been part of the boat since launch day. It also needed to be stout enough to serve as the new termination point for the main sheet and contain enough volume for a clever hidden storage space for all the yacht's fishing gear. 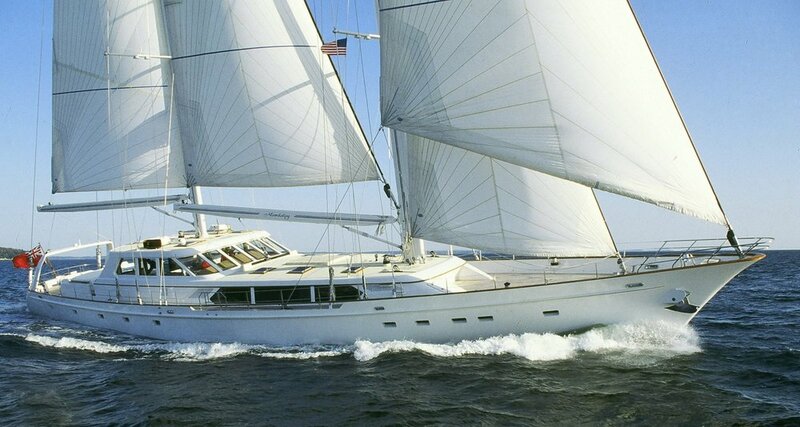 During this time the aging roller furling aluminum masts, which were among the largest ever built when Mandalay was new, were replaced with state-of-the-art carbon fiber spars with in-boom furling which allowed the use of battens for increased sail area and improved shape. The weight saved aloft transformed the already stiff yacht into a powerhouse. A full knot of speed was gained in most sailing conditions. The masts were designed and built by Offshore Spars in Michigan and the furling booms were produced by New Zealand's Marten Spars. The skills of a good designer are as important to the success of a refit they are to the construction of a new yacht. We are proud of our contribution to the rebirth of Kaori. A perfectly executed refit. Mandalay becomes Kaori. No one would know she hasn't looked like since launch day.